We had some success on our hunt and have a bit of meat cutting to do now. 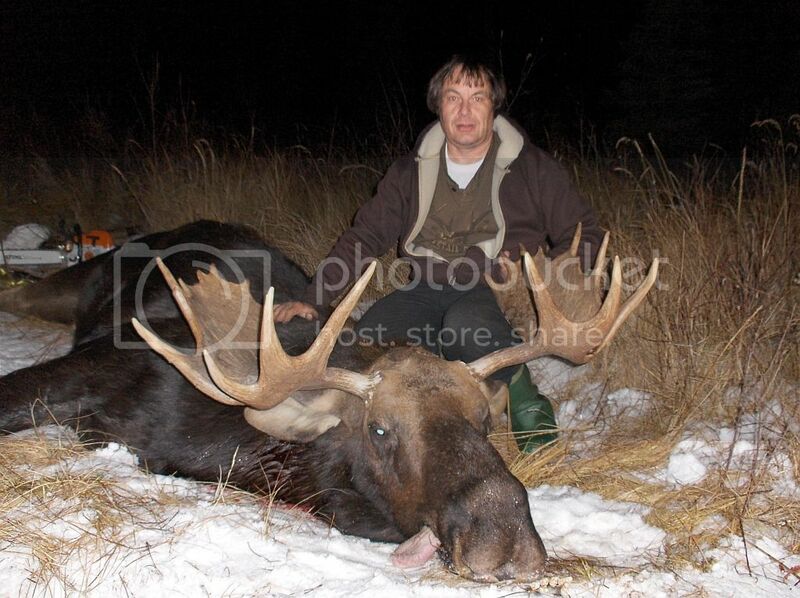 I filled my moose tag with a nice 45" bull that I called in. Actually, I managed to call 3 bulls in at the same time and had them all within 30 yards of me when one finally showed himself through a gap in the willow swamp and stunted tamaracks. I shot him high in the neck just behind the ear and he dropped like a stone. Easy shot from close range. I had all 3 bulls grunting and thrashing willows with their antlers. Who said you can't call in bulls in November....lol. They hung up for while and I was worried I would run out of legal light. One very soft bull grunt after cow calling only sent all three bulls into a tizzy and the one came out. It was a pretty intense 30 minutes with bulls all around me. I was happy with the one I got but we saw one of the other ones a day later in the same muskeg and he was a real bruiser. Neat part is that I shot my bull within about 50 yards of where I filled my last bull tag 3 years ago. My brother and Trevor both took a couple of quite nice whitetail bucks. I have pics of my brothers buck and will get a good pic of Trevors buck a bit later. It is on his camera. We sure had a mixed bag of weather this year but it was a good hunt. That's a real nice bull Axeman, congrats. Congrats on some fine animals. Good job. Nice bull and bucks. I take off tommorow for 5 days up there. Nice job hunting for Duane, Dave and Trevor. 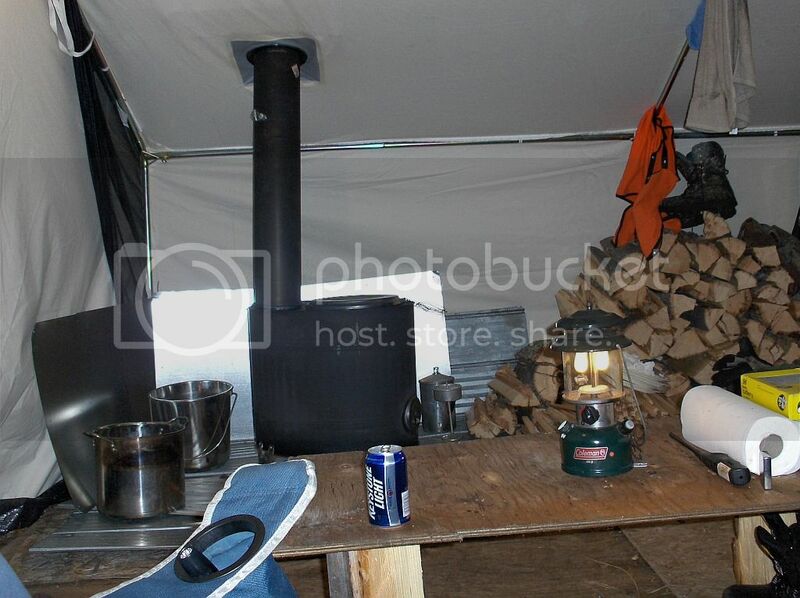 The new stove I bought from Paul in Sylvan this fall was great in the wall tent. Great deal and thanks again, Paul. 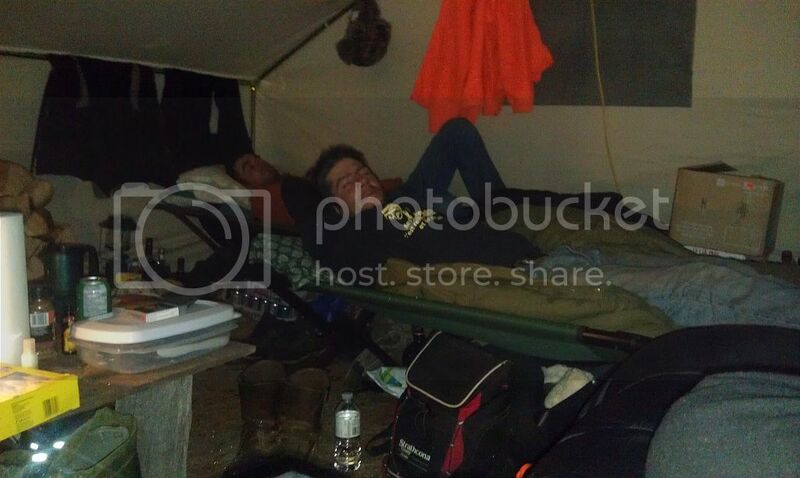 Camp was warm and comfy with all the wet weather and snow. Two mornings were sub -20 as well. We do a plywood floor in our walltent setup and carry a few sheets of old plywood in the bottom of the trailer for this reason. Takes up no room and makes camp that much nicer. These little airtights work great and in my opinion outperform some of the heavier models out there. I have used almost everything out there and quite a few home builts too. Glad the stove worked out for you Dave you must have had a lot of extra stove pipe eh? good stuff as always axe. 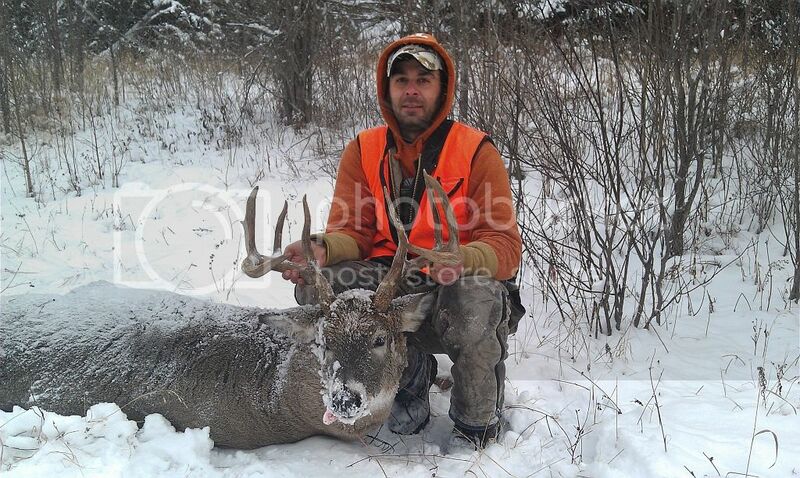 even the average bucks from your area are pretty decent. and also, i knew the year wouldnt get away from you without a moose going down. congrats on what looks like a successful season. i coulda swore i already posted in this thread? sorry for missing you earlier....musta logged out before the reply went in. Way to go axe! thats a great bull! nice bush bucks too!